Full-bodied in flavor and a good choice for those who prefer the classic maple syrup flavor. 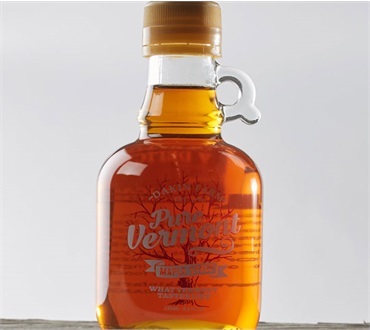 Compares well to the former Vermont Grade A Medium Amber and is our most popular grade of Maple Syrup! This syrup, item #895, is packed and shipped in our elegant glass jugs that make the perfect gift or a keepsake for yourself. All maple syrup from Dakin Farm is exquisite. I consider myself a maple syrup connoisseur so I would not try any other brand. We are a military family stationed in DC and we drive to Vermont once a year to load up on Dakin Farm products especially the maple syrup. We gift the syrup for holidays and people are always amazed how delicious it is. Once they try they don't go back to other chip products. We love it on everything from side dishes to breakfast to desserts. Full disclosure, it is possible to buy pure maple syrup in our local groceries, but I prefer to purchase pure Vermont products from Dakin Farm and support the state where my wife and I were wed and honeymooned. But sentiment aside this is quality product, this is a reasonably priced, attractively packaged syrup with a bold rich taste. We use it in our tea, in our oatmeal and in a variety of sweet and savory dishes and, occasionally, I pour a teaspoonful and indulge my inner child. THE BEST Real Vermont Maple Syrup! After living in Vermont for 50 years we know and appreciate Real Vermont Maple Syrup from Dakin Farm. Now that we live in Maryland near our grandchildren, thank goodness we can order it shipped in the new beautiful glass bottles, for gifts and for ourselves. We grew up on cheap high fructose corn syrup "table syrup" and after tasting the real deal, even the thought of the numerous maple syrup imposters makes me cringe. Now, I make sure I have all three grades on hand at all times so I can achieve the perfect level of pure maple flavor in my coffee, over my breakfast plate (yes, the whole plate..), or by the spoonful to satisfy my relentless sweet tooth. This syrup makes the PERFECT gift and is always appreciated as a "thank you". The empty jar makes the cutest home for wildflowers once the liquid gold is gone!